Taking a tour by air around Southern Labrador in Newfoundland Labrador, Canada lets one capture the aerial views of the landscape. The town of Mary's Harbour is easy to access by roadways, which has become a fairly recent addition, by air and by sea. Aerial view of the town of Mary's Harbour, Labrador Coastal Drive, Viking Trail, Trails to the Vikings, Southern Labrador, Labrador, Newfoundland Labrador, Canada. 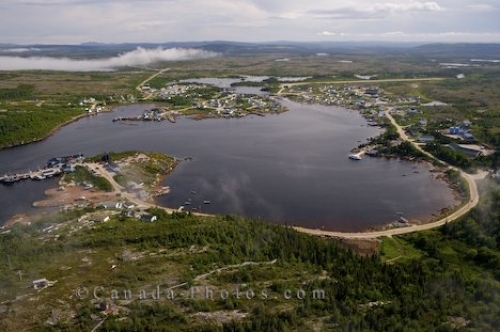 Aerial of the town of Mary's Harbour in Newfoundland Labrador located at the mouth of the St. Lewis Inlet.